Mystery shopping has been around for a very long time, yet it still mystifies most. This book is written to help take the mystery out of this job and get you started right away. This is a step-by-step guide to starting, performing and reporting your mystery shops. You will find a legitimate company list, companies that will not charge you to work for them. Websites, types of shops the companies perform and company expectations. You will find where to look for support as well as where to talk with other shoppers. 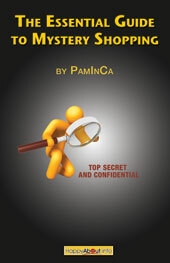 This book is an essential guide for you to start mystery shopping and making money right away.